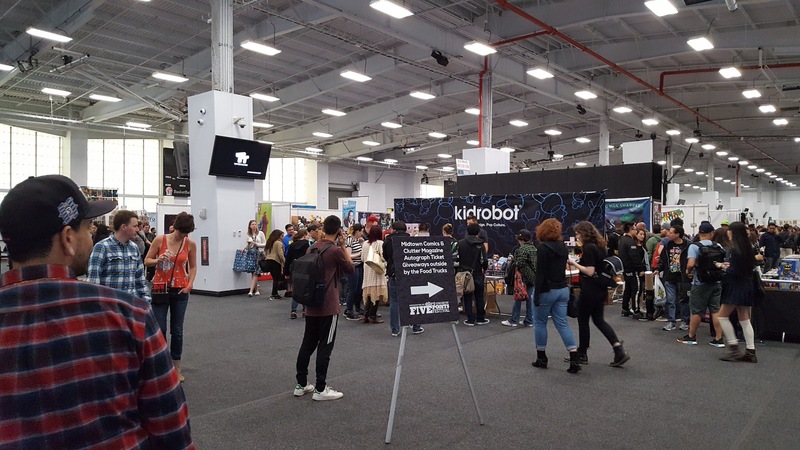 New York's Five Points Festival Carves A New Con Niche – AiPT! The photo’s not blurry; the whole night just looked like that. The Designer Toy Awards began as a tiny affair at Comic-Con International: San Diego in 2011, having since bounced around various events in New York City before finally arriving May 19 at the concert venue Webster Hall, as part of the first Five Points Festival, which took place the following Saturday and Sunday. Spurlock’s opening salvo symbolized the attitudes apparent throughout the Five Points Festival — following your dreams in defiance of authority and social norms, and, uh, drinking. Okay, that’s not so much an attitude, but there was a lot of it last weekend. The Designer Toy Awards were sponsored by (or “fueled by,” if you will) California brewery Lagunitas, and Brooklyn’s own Sixpoint brewed a sour cherry double IPA specifically for the Five Points Festival. Sixpoint was joined by the Brooklyn Brewery itself, as well as the Bronx Brewery and Coney Island Brewing, in presenting Five Points attendees with an impromptu beer garden in the parking lot of the Lower East Side’s Basketball City. Brutherford Industries even made stuff right on site! The Five Points Festival filled that 70,000 square-foot space with over 100 designer toy developers, and even more comic creators and vendors. Many of the big-name writers who showed up, though, like Dan Slott, Scott Snyder and Bryan Lee O’Malley, were only available for signings at the booth for Midtown Comics, who co-curated the event with art toy magazine Clutter. The comics side of the building was much less crowded, and that whole aspect felt more like an afterthought. But that’s fine, as we’ve already got October’s massive New York Comic Con to get that fix. Five Points, named after a 19th-century area of Manhattan known for its extravagance and outcasts, fills a niche for the DIY geeks looking to make their ideas three-dimensional, and to share them with the world. If they can continue this momentum and work out some of the kinks (like one of the promised food trucks not showing up, taking the the festival’s hipster rating down a notch), Five Points can be a fine addition to New York’s con scene, showing the creativity and drive of an otherwise underrepresented aspect of fandom. Amazing, frightening creations by A1 Plastik. Check out the winners of the Designer Toy Awards here, and a list of the Five Points Festivals exhibitors here. And our visual look at the convention, for 2-D representations of the 3-D creations!